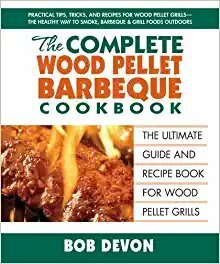 "The Complete Wood Pellet Barbeque Cookbook", by Bob Devon, is so interesting. Wood pellet grill cooking is not something I know a lot about. My husband recently got a grill that uses wood pellets. The diagram of the wood pellet grill is phenomenal. It shows exactly how this works and most people probably don't know that. I like that the operation and maintenance steps are included in the beginning of the book. Choosing the wood pellets is an important step and there is a whole page about the different flavors. Not sure what temperature to cook your brisket to? This book has it. There is a whole chapter on spices and marinades, oh my. This book gets better and better. By far my favorite section of the book. The rest of the cookbook is mostly recipes. None had pictures and that was a bit disappointing. There is a page on the best dessert wines. The section that lists resources on where to get the spices, pellets, etc. is a great inclusion. Place all ingredients in a bowl, and use a whisk to blend well. Use the seasoning blend as directed in the recipe of your choice, and store any remaining blend in an air-tight container for up to 6 months. This is enough to use on 4 pounds of meat. While I like the variety and simple, easy to follow directions, pictures would have added to the excitement of this cookbook.